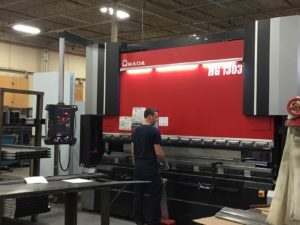 Feb. 8, 2018: Montreal, Quebec: Electron Metal has expanded facilities in their Laval plant and has recently added a specialized Amada Bending machine. The machine will enable Electron to provide faster service and more customized metal cabinets to their customers. Electron Metal has been producing top quality racks and cabinet enclosures to the telecommunications, information technology, security and broadcast industry for over 30 years. Today’s IT equipment and structured cabling demands are greater than ever and customer’s facilities require flexible solutions for cooling, power distribution, grounding, environmental monitoring and cable management. Electron Metal’s server cabinets, network cabinets, seismic cabinets, colocation cabinets and broadcast cabinets offer everything a small business or a mission critical application could require. Learn more at www.electronmetal.ca or call us today: 1-866-96-RACKS.